Part of the 'Vision 2020' series, we look ahead to the year 2020 at aspirational feats of exploration supported by the capabilities of Blue Abyss. Written by Andy Torbet, Extreme Explorer, BBC TV Presenter and Blue Abyss Consultant, this fictitious report will give you a flavour of things to come. In July 2020, what is considered to be the largest collection of Paleolithic art is uncovered through a narrow underwater entrance in a cave system off the coast around St. David’s, West Wales. Without the advances of technology, just how long might this historic find have lain undiscovered? In 1985, Henri Cosquer, a lone diver investigating an underwater sea cave off the coast of Southern France, surfaced in a dry, air filled chamber, having swam through an underwater passage. This chamber had been cut off from the world for over 10,000 years due to rising sea levels in the Mediterranean in the Paleo- and Meso-lithic eras. He was not the first person to gaze upon ‘Cosquer Cave’, but he was the first in over 10 millenia to evidence what he found. The cave walls where covered in Paleolithic art: handprints, symbols, carvings and paintings of animals including bison, ibex, horses, seals and jellyfish. In Britain, the oldest human remains, the ‘Red Lady of Paviland’, a Paleolithic male, was discovered in a cave in Pembrokeshire, now only accessible at low tide. But when the body was buried here 33,000 years ago the cave would have been some distance from the shore. What other ancient discoveries lay untouched and preserved within unknown marine cave systems in Europe waiting to teach us about our ancestors? To answer this question, extreme environment research, development and training centre, Blue Abyss, launched the Blue Abyss Ancient Remains Expedition, bringing together a specialist team of oceanographers, geologists, archaeologists and cave divers. First, the oceanographers predicted sea level fluctuations over the past 30,000 years in the Mediterranean, Baltic, North and Irish Seas and the North Atlantic Ocean around North West Europe. They cross-referenced their predictions with the locations the geologists had determined to be areas with ‘high cave probability’ based on the local underwater and coastal geology. Finally, the archaeology team were bought in to determine which of these areas were likely to have been occupied by humans in the 35,000 – 12,000 BP (Before the Present) period. This was based on physical evidence discovered in the area and predicted population and movement patterns. Eight key areas were flagged for further investigations. These areas were mostly, but not exclusively, limestone karst landscapes and included South West Wales and Western Ireland. The beautiful coastline of St. David’s, West Wales. Surveys were then carried out by technology created, developed and improved at Blue Abyss including high resolution Multi-Beam Sonar, Sub-Durface LiDar and Marine Deployed Ground Penetrating Radar (MDGPR). Target caves were identified and primarily investigated by a new underwater Remotely Operated Vehicle (ROV) nicknamed ‘The Octonaut’. The Octonaut can operate without a tether and, as well as surveying the cave system, can transmit broadband quality real-time video through BlueComm transmission. Like the boat deployed survey equipment, this new system was developed by a commercial robotics company using the Blue Abyss laboratory and test pool. Once the Octonaut had completed its work, there were a total of 16 caves with airspaces determined to be worthy of investigation by qualified personnel. Cave diving, especially in unknown systems, is a specialist undertaking and a world-class team comprising of Andy Torbet, Rich Stevenson, Phil Short and Gemma Short was assembled to undertake the final investigations. Although none of the caves were deeper than 60 metres below sea level or longer than 500 metres in length, the team still used the ‘Gill’. The Gill is a new Closed Circuit Rebreather (CCR) system developed and patented by Blue Abyss using EVA technology to allow divers to go deeper for longer than ever before. The system has overcome the thickening of breathing gas at depth to allow divers to exceed 400 metres, and an increase in CO2 scrubber material creates the potential for divers to stay submerged for up to 24 hours. The onboard survey equipment, ROV and rebreather were all developed using the Blue Abyss lab and pool to facilitate extreme dives just like this one. This combination of market-leading technology allows us to achieve so much more than Henri Cosquer could have dreamed of 35 years ago," says Andy. 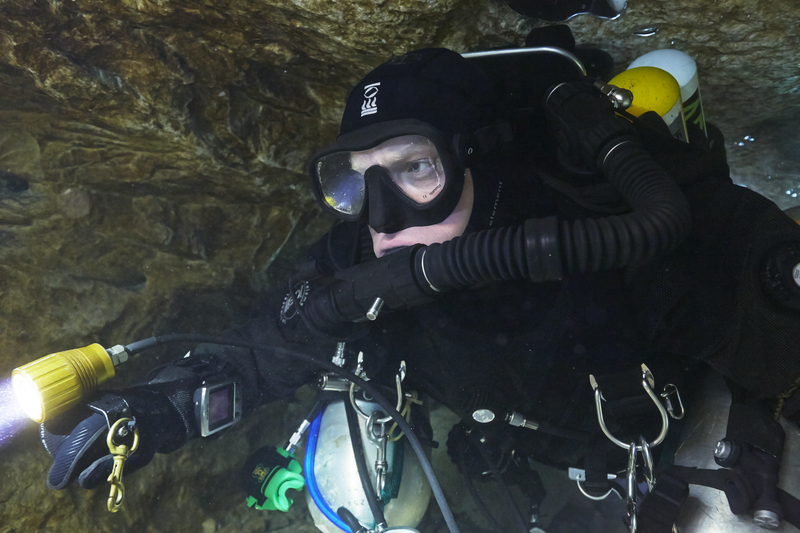 Underwater explorer and specialist cave diver, Andy Torbet, explores the cave system. Of the 16 caves, seven were determined to harbour potential archaeological remains. The most likely contender was located in a dry network of caves accessible only by a single entrance point 46 metres below the water’s surface in St. David’s, West Wales. To reach the entrance, the dive team entered the water from the research vessel and swam vertically down the submerged cliff. The rough seas above initially hampered visibility until the team entered the cave system, where the water was a good deal calmer. They explored the underwater passages with the help of purposely-developed Saturn torches, capable of producing 50,000 Lumens of light. Fortunately, the network of passages was not complex, with only three side passages in total. The divers spent up to six hours-a-day for six days mapping and recording the underwater system with 3D scans and Virtual Reality footage, before spending a further four days recording the dry passages. Using this technology, surface-based scientists were able to ‘virtually cave dive’ to fully investigate the findings. The most impressive of the discovered caves was named in honour of Blue Abyss founder, John Vickers. ‘Vickers Cave’ shows evidence of over 2,000 separate paintings making it potentially the largest collection of Paleolithic art in the world. The Paleolithic, or Stone Age, is the longest period of human history and it is thought to have ended some 10,000 years ago. 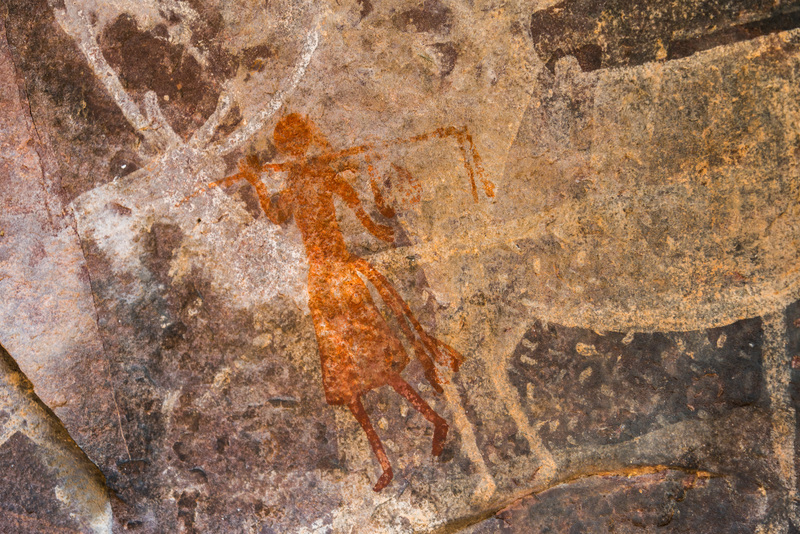 Our Stone Age ancestors grouped together in small societies and spent most of their time searching for food as the Vickers Cave paintings depict. They hunted animals, caught fish, ate insects, and gathered nuts, berries, fruits, grains and plants. They didn’t have a fixed abode, they were always on the move. It took the expedition team just 14 days to complete the survey to highlight the most likely areas for exploration, with a further 10 days of diving. The accuracy and speed in which the archaeological sites were discovered, proved to be the keystone of victory for this expedition, and a template for future expedition success. This was achieved through the development and use of specialist pre-dive apparatus, the ROV and dive equipment, and a multi-disciplinary team of experts. Without this, Vickers Cave may have remained lost forever, or at best, it could have taken many years to locate and explore. It’s hoped that this cutting-edge technology including the Gill CCR, which has a potential of operating at 400 metres, will be utilised for future Blue Abyss missions and other publicly or privately-funded expeditions. In the meantime, Blue Abyss are carrying out cave diving training for a select group of archaeologists to allow them to carry out further surveys, investigations and conservation over the next 5 years, and UNESCO World Heritage status is in the process of being approved. The universities and academic bodies involved in this year’s Blue Abyss Ancient Remains Expedition are gathering funding for further work on the site and also to expand the search area in future years to locations outside of those initially considered for this project. Each year, Blue Abyss mounts an expedition with the purpose of exploring harsh environments for natural history, conservation, life science and archaeological discovery and research purposes. "We were inspired by the Paleolithic art discovered at Cosquer Cave, but we wanted to use modern-day technology to help us locate and explore sites to give the project the best possible chance of success. This was the birth of the Blue Abyss Ancient Remains Expedition," says John Vickers, Managing Director, Blue Abyss. The content of this article is fictitious but it illustrates a reality that is just around the corner.